Mason Bees Are Native Pollinators! 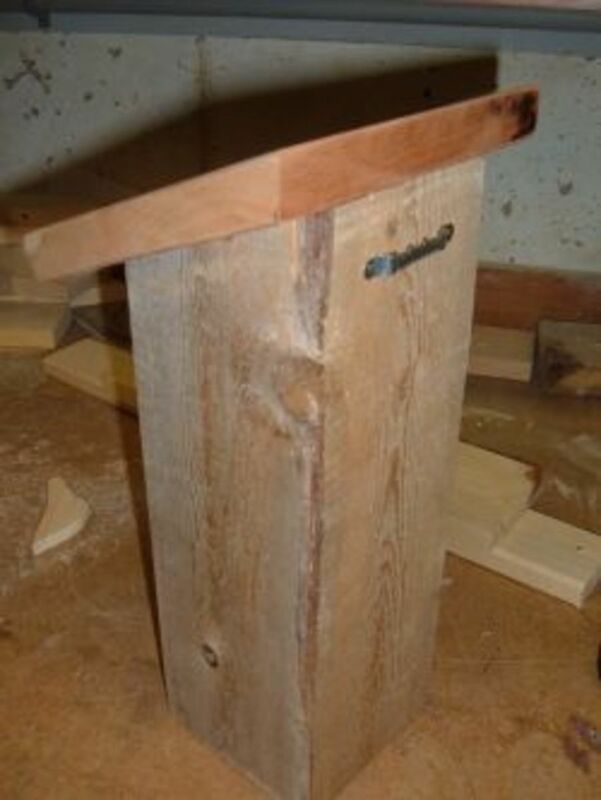 Making a mason bee house is a simple woodworking project that takes just a few minutes to build, and making a bee house is a great project for using a few pieces of salvaged lumber and scrap wood. A mason bee house is also a fun project to make with kids, especially after they can watch the bees build their nest in a project that they made themselves. Mason mees are natural pollinators. They are also solitary and unlike the honey bee, they do not live in colonies. Instead, the females do all of the work themselves, seeking out natural cracks and crevices to lay their eggs such as hollow twigs and the abandoned holes bored out by beetles. Female mason bees will readily move into the tunnels bored into this little bee house to lay their eggs. Though they do not live in hives, groups of females will nest together, and they don't seem to mind the company from their neighbors. 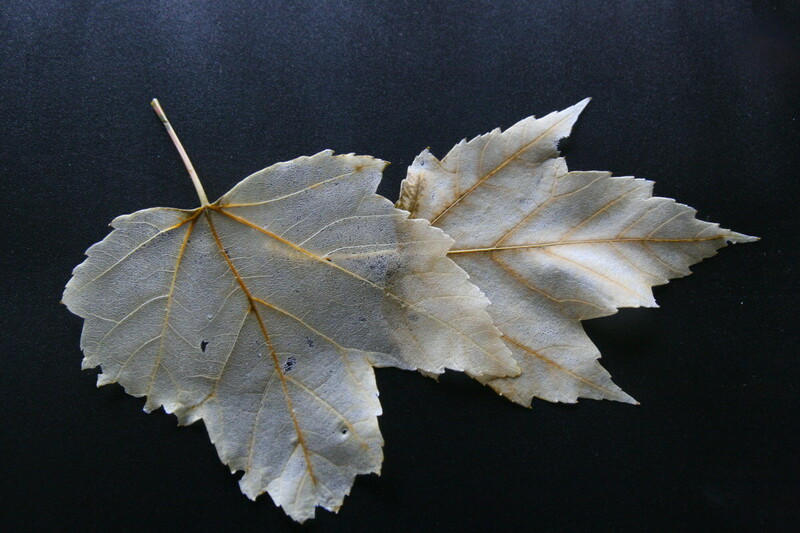 The eggs remain dormant through the fall and winter, and offspring emerge in the spring to pollinate plants. 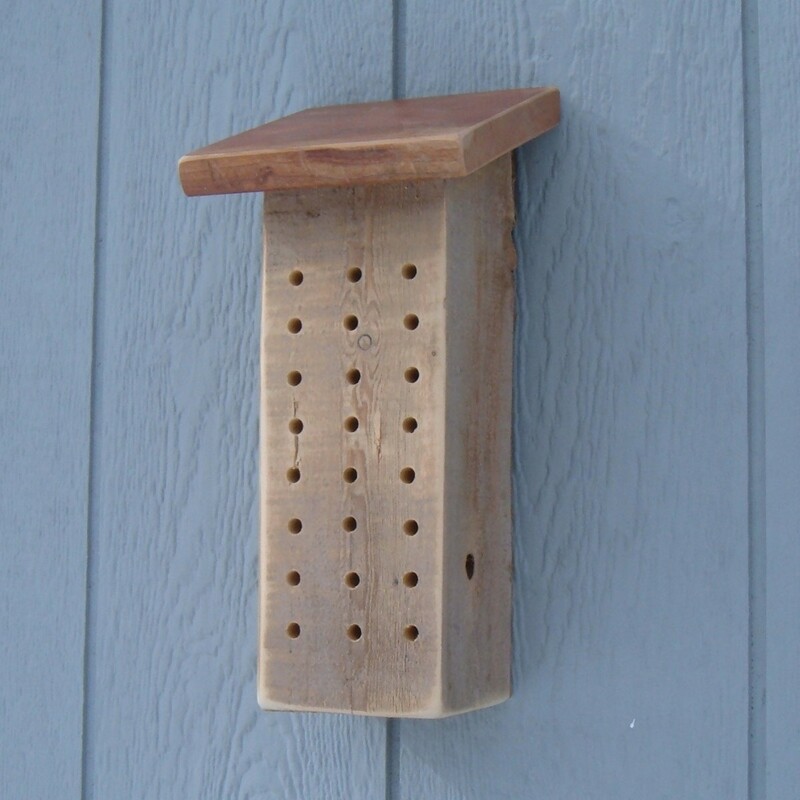 The mason bee house is a simple structure made from a 4x4 pine post. The exact size and dimensions of the the bee house are not important, so use whatever pieces of recycled lumber or scrap wood are available. If you do not have a chunky post, simply laminate a few pine boards together. The wider the boards, the deeper you can drill the holes for the nesting tunnels. I used a piece of weathered pine post that is about 14" long. Do not use cedar or redwood, which is naturally insect-resistant and may discourage mason bees from setting up residence. The top of the pine post is cut at a 22-1/2 degree angle to form a sloped roof to shed the rain. My power miter box is not large enough to cut all of the way through the post, so I finished the cut with a hand saw. The 6" x 6" roof was cut from a piece of 3/4" thick cherry, recycled from an old shelf unit that was destined for the landfill. The back edge is cut at the same 22-1/2 degree angle to match the slope of the roof. 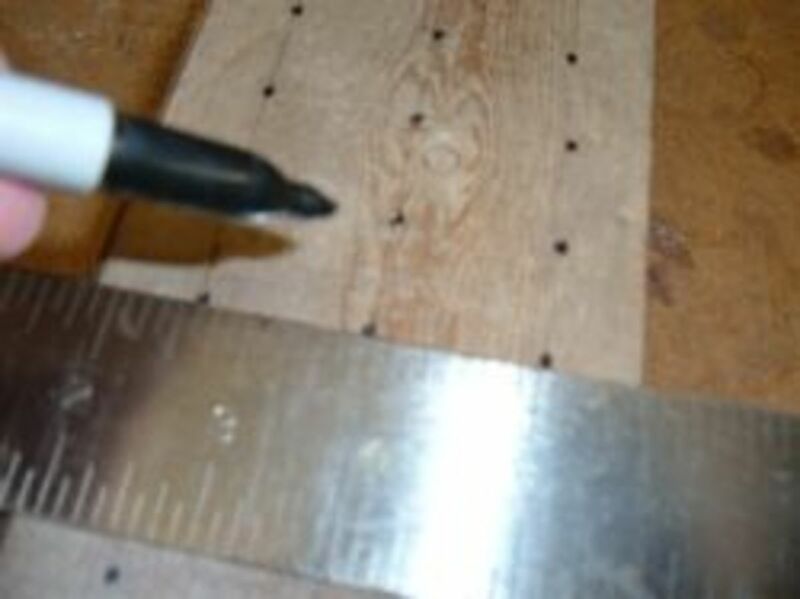 For a uniform pattern and a neat appearance, take a few minutes to lay out the locations of the holes before drilling. I started by measuring to find the middle of the front side of the post (the shortest side after the sloped bevel cut for the roof), and then drawing a center line down the length of the pine board. Marking the center at both the top and the bottom helped ensure that the line is placed down the center of the post. Next, I measured 3/4" in from each side, again marking both the top and bottom of the post, and then drawing another set of lines for the other two rows of holes. Starting at the top of the post, I measured down 2" and made a mark on the center line to indicate the location for the first row of holes. Using a square, I transferred the first mark to the other two lines, marking three locations for the first row of holes. Measuring down 1" from the first row, I repeated the process to mark the locations for each of the holes in the second row. This process continued until I reached the last row, which is about 1-1/2" up from the bottom of the post. The bees are not fussy about the patterns for the holes, and the lay out lines are purely for visual appeal. Rather than measuring and marking each hole location, you could use a small piece of peg board (with evenly spaced holes) as a template for evenly spacing and marking the locations for the holes. A drill press makes quick work of drilling out the 24 holes in this version of the mason bee house, but a hand-held drill will work just fine too. 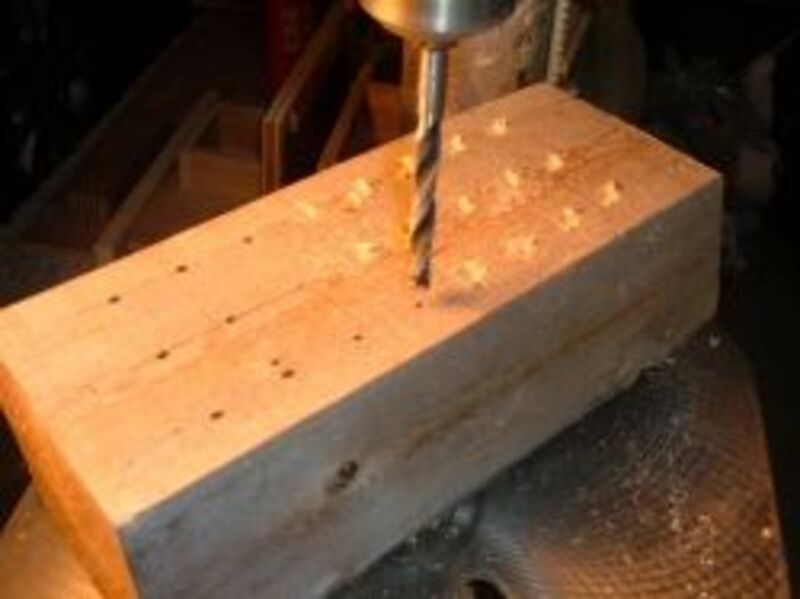 Drill the holes as deep as possible, using a 5/16" diameter drill bit. The female bees prefer laying their eggs in deep tunnels, and all of the holes are at least 3-1/2 deep. 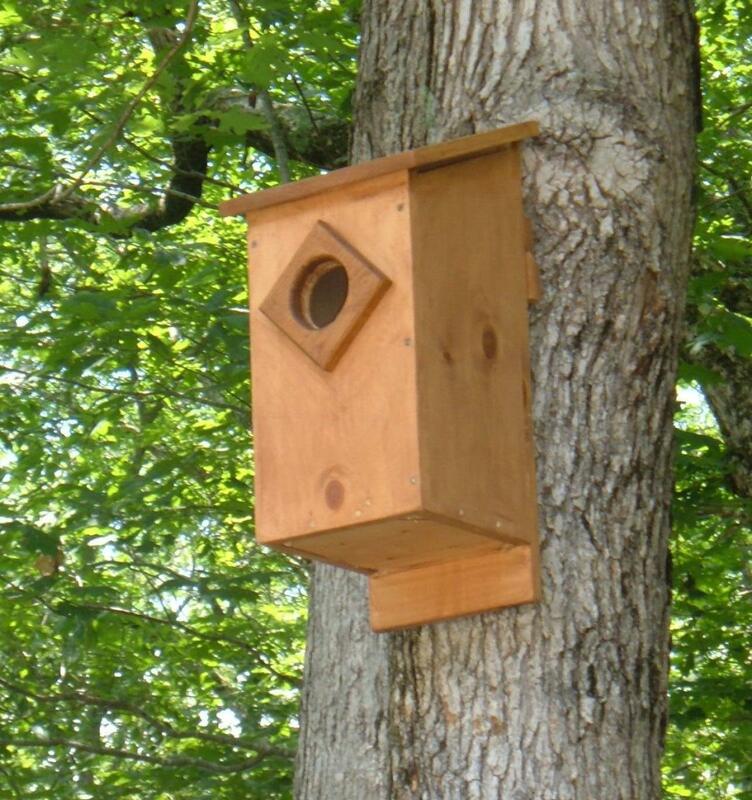 Many mason ee house plans feature wider (deeper) designs allowing for longer tunnels, and the deeper the depth of the nest box, the better for the bees. Use a small piece of sandpaper wrapped around a piece of dowel (or a pencil) to clean up the edges of the freshly drilled holes. If you have a longer 5/16" drill bit, consider drilling the holes all of the way through the post. Then, cut a "backer board" to fit the back of the post, and attach it to the back of the bee house with a few weather-resistant screws. The removable back section makes it easy to clean out the debris from tunnels after the young Mason Bees leave the nest. The roof was cut from a piece of cherry wood that I salvaged from an old shelf unit. Cut into a 6" x 6" square, the roof overhangs the post by 1" on either side, and nearly 2" over the front of the bee house. Four weather-resistant nails hold the roof in place. Though the bee house was made from salvaged pieces of weathered wood, the finished piece looked better after a quick sanding to soften the sharp edges, smooth out the saw cuts and to round over the corners of the post. A standard picture frame hanger makes it easy to hang the finished bee house. Hang your new bee house in a sunny location in the garden. I hung one south-facing wall of our garden shed and is ready to host the next generation of mason bees. There are over 300 different species of mason bee. The two of the most common species found in North America are the Blue Orchard Bee and the Horn-Faced Bee, while the Red Mason Bee is common throughout Europe. Smaller than a honey bee, these little bees live for only six to eight weeks, but can visit and pollinate over 1,000 blooms each day of their short lives. Mason bees rarely sting, making them welcomed guests to the garden. 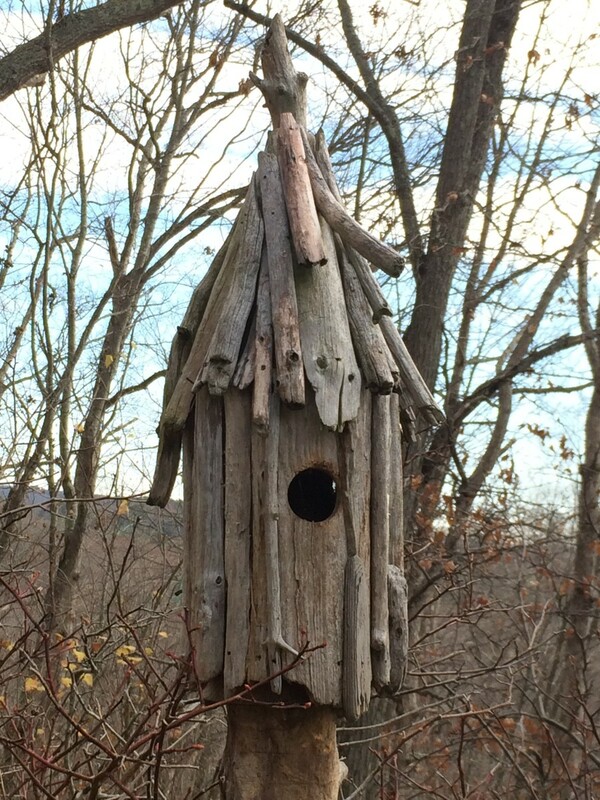 Have You Ever Seen A Mason Bee House? Keeping native non-stinging mason bees - even in urban spaces - is a surprisingly easy way to help the environment, and it's also an inexpensive and educational project for kids. The Mason Bee is named for its habit of using mud to build nest compartments. The orchard mason bee is one of the best pollinators around. They can easily be mistaken for a small black & blue fly about 2/3 the size of a honey bee. 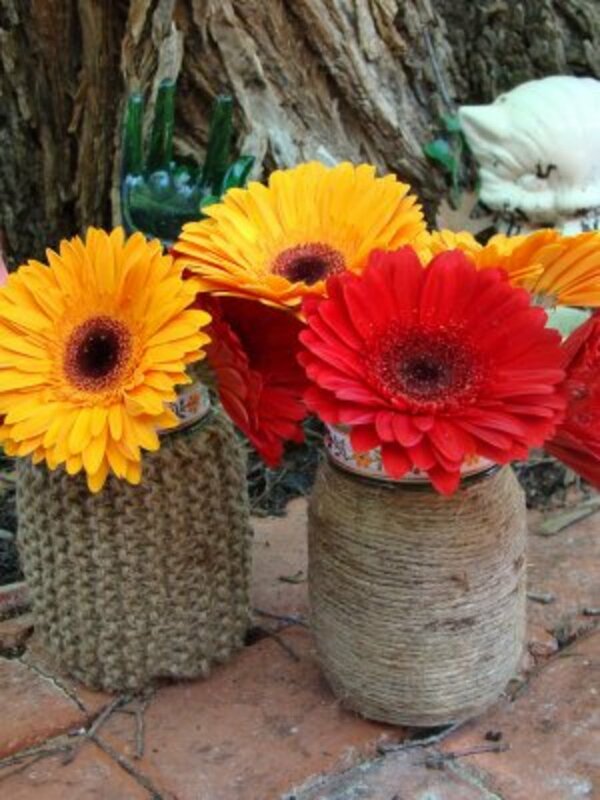 Keep the flowers blooming! Pollinators include including bees, birds, butterflies, bats, beetles and other animals. Do you bring your hive into a non-heated shed in the winter? There's no need to move the mason bee house inside for the winter. I leave mine outdoors all year long. Can mason bees be found in Alberta, Canada? 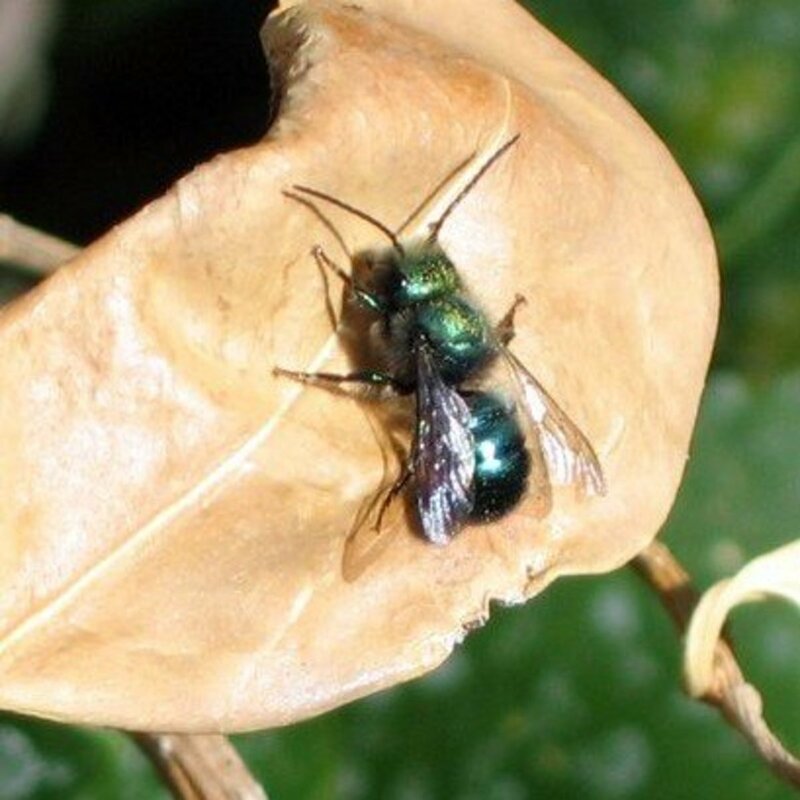 According to the Salisbury Greenhouse, the mason bee is a native bee species found in Alberta, Canada. Do The mason bees live in Texas? According to the Native Plant Society of Texas, the mason bee is one of hundreds of native bee species found in Texas. How should I clean a mason bee house for continued use? A small stick or skewer works well for clearing the dried mud from a used tube. So far, I have not cleaned out the tubes that were used by the bees. There are still plenty of open holes that are ready for occupancy. Will You Put Up a Mason Bee House? Thanks for visiting! Cleaning out a tube that is filled with mud could result in killing the developing wasp that's still inside. However, if the tube was used and the wasp has already left, then you could use a small stick or skewer to clear any remaining mud from the used tube. My mason bee houses have plenty of new, unused holes that are still available for occupancy, so I have not cleaned out any of the used tubes. I'm learning, have made 6 small bee houses and ordered some bees from a company....very excited to experience all this as I have several fruit trees and many flowers. Wonderful article! 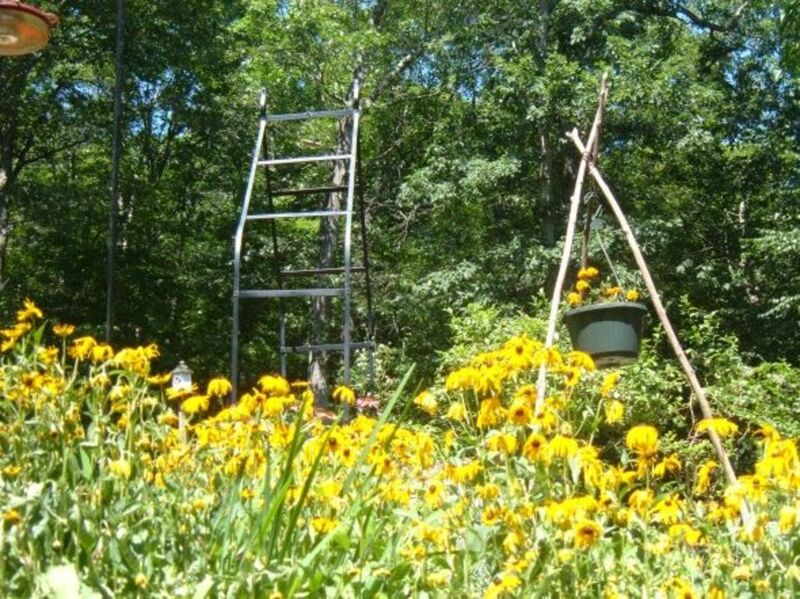 I've always been interested in making a Bee house..."Give bees a chance." Nice article. This is a great idea. Too many people are scared of bees, so are unlikely to make such a thing. I would like to do this, but my garden is tiny and by boyfriend is terrified of anything black and yellow striped flying around. I have tried to explain that bees are unlikely to sting, but he will still run at even a buzz coming towards him. I might pass this on to my mum as her garden is much bigger, and there are no such phobias in her house. Brilliant hub. We have fruit trees so like having the bees around but for the past couple years we have had a major wasp problem we have been working on. They have really become a problem in our area over the past few years and are certainly prolific. Difficult to get rid of as they just keep coming back. Hope your summer is going well. You certainly are multi-talented. 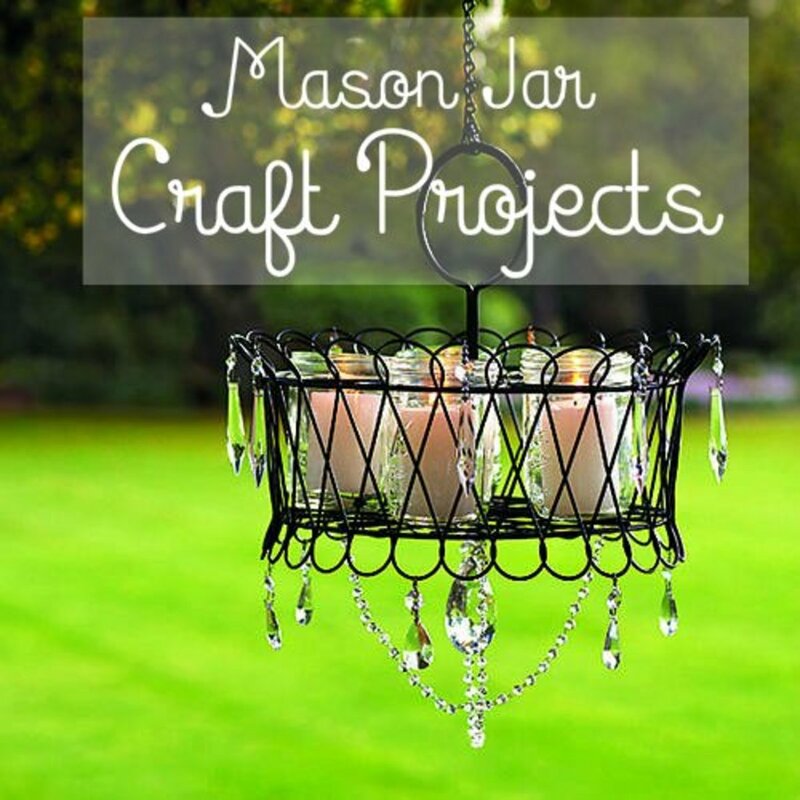 Your home wood crafts that are designed to blend with nature are so very impressive. This is so cool. I wasn't aware of Mason bees or the type of structure they prefer for their eggs. I'm all for bees and want to do my part in helping them. I'd love to build one of these Mason bee houses. Thanks so much for the plans and instructions. Appreciated!